Instagram worthy locations throughout the hotel, including the building itself! Visit the Crowne Plaza Manchester Oxford Road website for the best rates and to use your IHG points. For the latest events and pictures check out the Instagram and Facebook feeds. 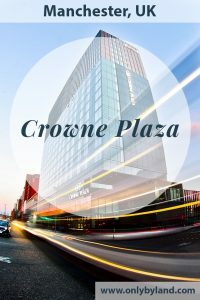 The Crowne Plaza is a 10 minute walk from Manchester Oxford Road train station. 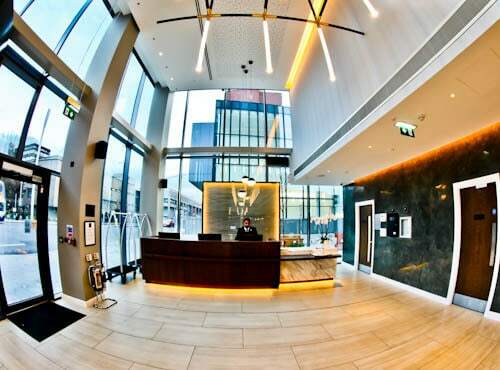 It’s located in a stunning brand new building which should be a Manchester landmark itself. 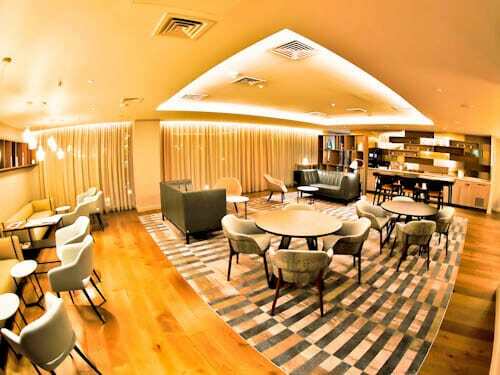 In fact, it’s a double decker hotel shared with IHG partner, Staybridge Suites Manchester. You’ll enjoy panoramic views of Manchester as well as the historic university campus. 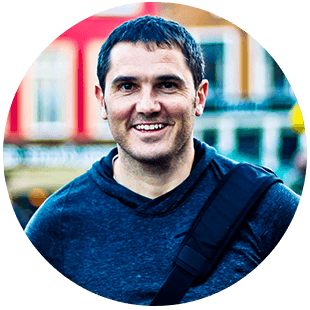 It’s a 15 minute walk to the famous Manchester city center shopping district. 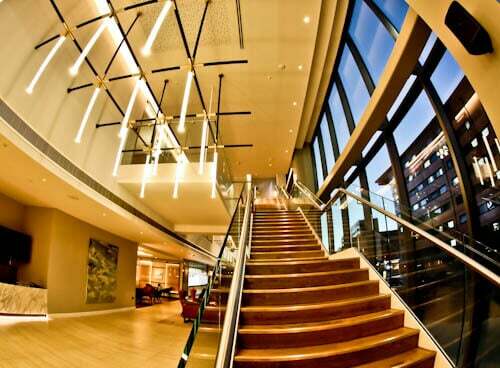 At check in you’ll receive a warm welcome to Manchester and to the hotel. Friendly staff will ensure the transition from reception to your room is comfortable. Of course, they’ll share the WiFi password with you, so you can stay connected. Any questions or queries you have about your stay, or Manchester, they’ll be more than happy to answer. Adjacent to the check in area is an Instagram worthy staircase. This staircase is the perfect location to take your Instagram pictures with the elegant lighting in the background, dress up! The guest rooms at Crowne Plaza Manchester Oxford Road offer everything you need to enjoy your stay. As you would expect from Crowne Plaza, there’s a flat screen smart TV, fast internet and mini bar. 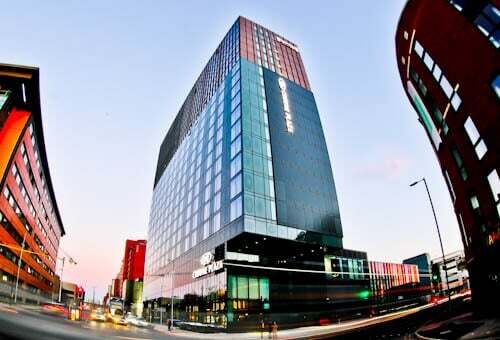 The difference between this hotel and other Crowne Plaza hotels are the incredible views over Manchester. Be sure to request a room on a higher floor. To enhance your sleeping experience, I recommend you use the complimentary deep sleep pillow spray before bed. 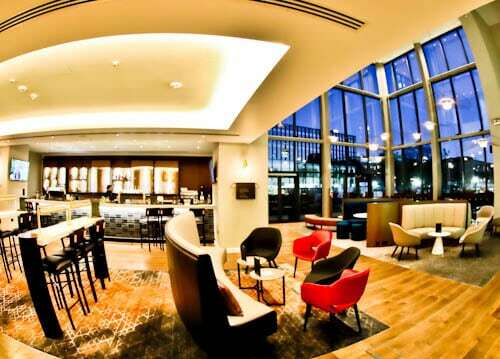 If you upgrade to a Club Room, you’ll have complimentary access to the Club Lounge. You can relax anytime in the lounge, additionally, tea, coffee and snacks are served. 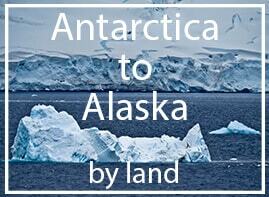 For a couple of hours each evening, you may also enjoy complimentary alcoholic drinks. 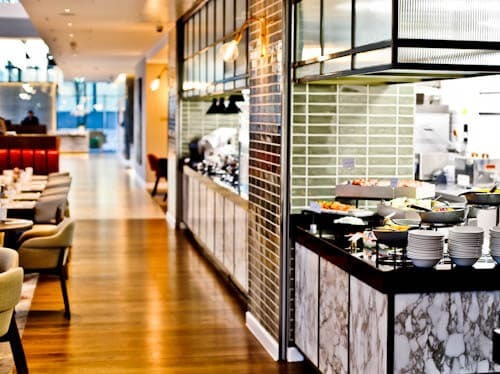 A separate breakfast buffet is served each morning for club members, alternatively, you can also enjoy the buffet breakfast on the ground floor. 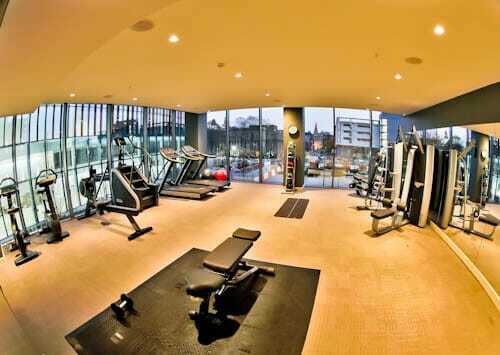 The spacious fitness center is open 24 hours a day, as a result you can visit at your convenience. There are plenty of free weights, medicine balls as well as a variety of cardio machines. Furthermore, if you wish to take your run outside, you can check out the local running routes displayed on the wall. The breakfast buffet is huge and full of delicious treats. You can choose from a large selection of hot food, cold meats (including salmon), cereals, fresh breads and sweet pastries. To drink you may choose freshly prepared tea, coffee as well as a large selection of fruit juices. In addition to the buffet, you can order eggs as you like them from the egg station. If you choose a window seat for breakfast, you’ll get a feel of the city of Manchester waking up around you. The Graduate Bar is the perfect place to unwind and enjoy a drink or two. You can choose from a selection of beers, wines and cocktails. You may also order snacks as well as meals from the adjacent Laureate restaurant. If you wish to go for a meal out whilst you’re in Manchester, you should check the menu at the ground floor Laureate Restaurant. 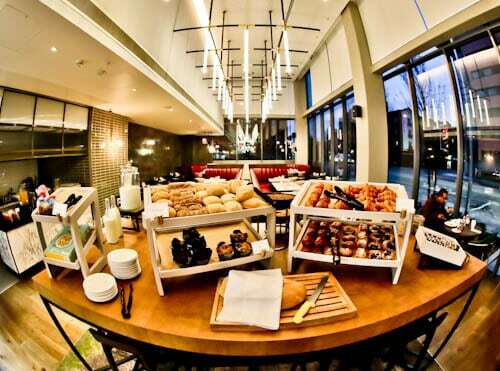 Additionally, the breakfast buffet is also served in the Laureate Restaurant. Cooking shows such as Celebrity Masterchef are incredibly popular throughout Britain. 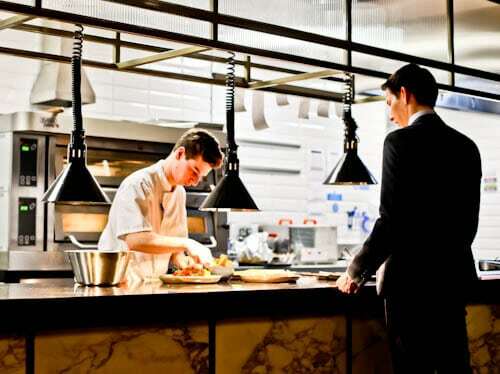 With the open kitchen, you can enjoy watching a real life masterchef as you eat. 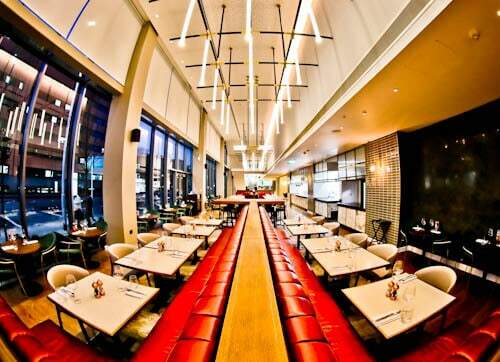 It’s also shows you are eating freshly prepared food from a sparkling clean kitchen. 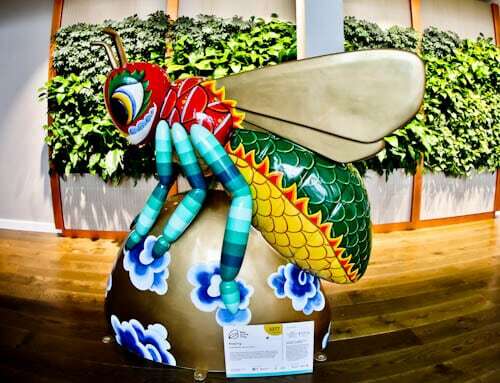 The worker bee is the symbol of Manchester, for this reason you’ll see them all over the city. One of the most interesting Manchester worker bees in the city is located adjacent to the Graduate Bar. A photo with this bee is a must when you visit the Crowne Plaza Manchester Oxford Road. I’m sure you’ll be very impressed with the incredible views of Manchester. In fact, I’d be surprised if you weren’t impressed with every aspect of this hotel! 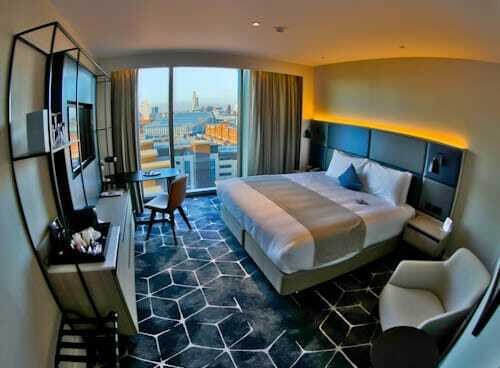 Check out the Staybridge Suites Manchester which is adjoined to this hotel.